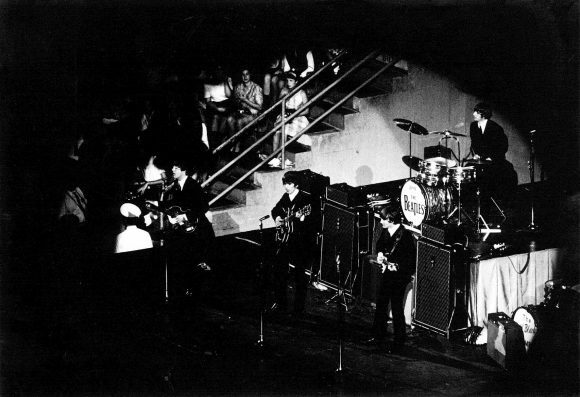 The Beatles performed for 14,000 fans at the Cincinatti Gardens venue in Cincinnati, Ohio. The concert was nearly cancelled after the Musicians' Union demanded that local groups be put on the bill. After a telephone campaign by Beatles fans, the union withdrew their request. The Beatles arrived at Cincinnati Gardens at 6pm, and spoke to Elvis Presley on the telephone backstage. A press conference was held before showtime, and they took to the stage at 9.35pm. The Cincinnati Enquirer's report of the show was headined "Teenagers Revel In Madness: Young Fans Drop Veneer Of Civilisation For Beatles". It reported 115 degree temperatures in which fans fainted and hysteria ruled, and claimed that a local television station technician attempted to measure the sound of the crowd but was forced to give up when his equipment overloaded and broke. The Beatles performed a standard 12-song set during most of the tour, and this date was no exception: Twist And Shout, You Can't Do That, All My Loving, She Loves You, Things We Said Today, Roll Over Beethoven, Can't Buy Me Love, If I Fell, I Want To Hold Your Hand, Boys, A Hard Day's Night and Long Tall Sally. After the show The Beatles ran to their Cadillac limousines and were taken to Lunken Airport. Their chartered aeroplane took off just after midnight, and landed in New York at 2.55am.